Multistarrer film Seethamma Vakitlo Sirimalle Chettu First Look will be unveiled on May 31 along with a teaser on the eve of Super Star Krishna Birthday. 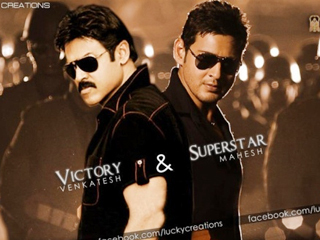 Fans of both the stars Victory Venkatesh and Super Star Mahesh Babu are eagerly waiting for the First Look to watch both these stars together. Venky and Mahesh will be seen as brothers in this family entertainer taking shape in the hands of director Srikanth Addala. Dil Raju is producing the film on Sri Venkateswara Creations banner with music by Mickey.J.Meyer. Samantha and Journey fame Anjali are playing the leading ladies in the film while Prakash Raj, Jaysudha and others will be seen in vital roles.